By Dr. Hampton Rowland Jr. Whenever I talk about Southeastern Indians I try to get people to think about other material than just stone tools and pottery. These materials certainly make up the major portion of what we recover archaeologically, but form only a small part of the items used by Southeastern Indians. This is one reason I have spent much time studying the use of cane in the Southeast and will try pass on some of this information. This map shows that Rivercane chiefly grows in Southeastern United States. The first thing to understand about cane in the Southeast was its abundance. Almost every early traveler had some remark about cane. 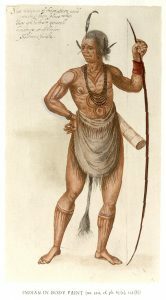 Benjamin Hawkins made a survey of most of the Indian villages in Georgia and west Alabama in 1799 and he remarked on cane being readily available in over half of the locations he described. Most of the living sites were all along streams or rivers where cane grows abundantly. Perhaps you may wonder why we no longer see the huge canebreaks that we described by the early writers.The tender shoots of new cane have been described as excellent cattle fodder and the cane can be destroyed by over grazing and by hogs rooting-out the roots. Cattle and hogs came in with the Europeans and were not native to the Southeast. 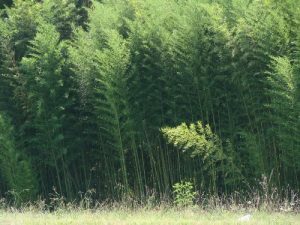 D’Iberville and others others state that the cane breaks could be easily cleared and provided rich and, even when green, can be cleared far easier than a stand of timber. Thus most large cane breaks disappeared due to animals eating it and to an increased need of rich agricultural land. We need to consider some of the characteristics of cane to understand why John Swanton considered it one of the most important of all raw materials used by the Southeastern Indians. There were two native canes.The largest is Arundinaria gigantea – giant cane- which can grow to over 25 feet tall and with a common diameter of up to two inches, although D’Iberville describes some cane along the Mississippi River as large as six inches in diameter. The other native cane species, Arundinaria tecta– switch cane or river cane- grows only up to 10 feet high and no larger than 3/4 of an inch in diameter. In a given grow of either, there will be tremendous size variation depending on spacing, available light,and soil fertility. On the scale of individual pieces, the differences in cane include variations in diameter, distance between the joints, straightness, and the degree of taper. In addition, the internal structure of cane provides opportunities for variation in usage. It is these that permitted cane to be used in so many different ways by the Southeastern Indians. The larger sections can be very stiff and strong. 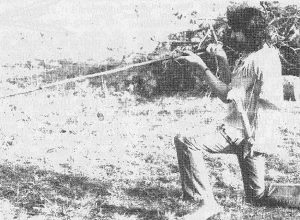 Cane has flexibility with this strength, even to the extreme tip of a fish pole, for example. Individual joints of cane provide various size containers or, with the joints removed, tubing in various lengths and diameters. One characteristic of cane that is often unrecognized is the availability of uniform or nearly identical pieces. We are used to having uniform manufactured materials, such as two by four inch lumber, for construction purposes. Finding trees of consistently the same size was a problem for the Indians. But in a cane patch, with a little selection, they could find two, a dozen, or perhaps fifty almost identical pieces. A final characteristic of cane is the ease and accuracy with which it can be shaped with stone tools. For example, cane can be split readily into strips of various widths to prepare materials for baskets or mats. Another common basket material, white oak, requires cutting trees into logs and then splitting the logs into strips-a very difficult process using only stone tools. A final characteristic is the effect heat and dryness on cane. Green cane can be straightened or bent by applying heat and bending pressure. It will retain the new shape, straight or bent as desired, when cooled. Strips can be soaked for flexibilty during weaving and then will become rigid again when dry. Green cane does not readily burn and can be used to make a grill over a fire for smoking of meat. 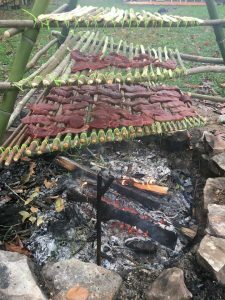 Although not yet documented historically for the Southeastern Indians, the cooking of food by stuffing it into sections of green cane and placing the sections over a fire is common practice with in the Far East and may have been practiced here. Finally, dry cane burns well as a fuel and gives off good light. 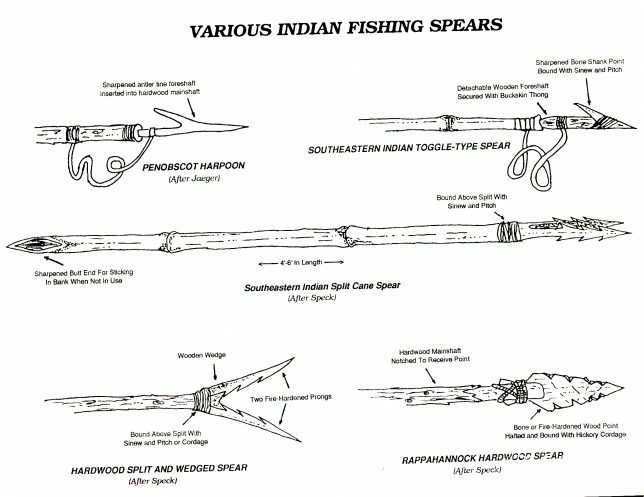 Weapons: Cane was probably the most common material for arrows in the areas where it was available. Garcilaso de la Vega gives some dramatic examples of penetration and wounds from cane arrows. Cane was also used for spear shafts [And Blow Guns!]. 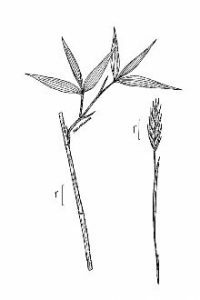 Food Collecting: Cane was used for fishing poles, of course, but was also used as set-poles where the fish would struggle against the spring of the pole. Cane was used for spring style snares and traps of all descriptions, using the ability to split-out the cane for funnel-shaped entrances. While not described in detail in historic documents, it would have been the best available material for fish weirs and other fish traps. There is an interesting historical reference to using circles of cane around rawhide to prevent animals from gnawing through snares. Baskets: Baskets were a very important use for cane. They play a major role in food collecting and storage. The construction of mounds required the use of baskets and it is quite likely that these were made of cane. 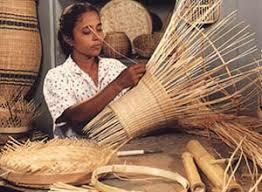 The Southeast Indians excelled in basket making during the historic period and their crafts are still collected today. 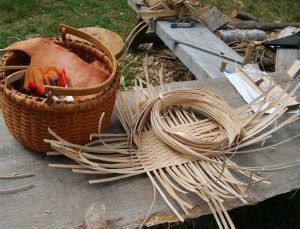 Early Virginia settlers refer to households making sets of Indian baskets so tightly woven they could hold water. I know of no references to cooking in baskets with hot rocks among Southeast Indians, although this practice was used by California Indians. We might assume, however, that baskets were used long before pottery was invented and were used for cooking. Construction: Palisades of cane were constructed in Mississippi around villages for protection. Fences were also constructed of cane during the historic period to confine. Cane was woven horizontally between vertical supports for wattle and daub house construction. There are also references to cane mats for the support of the clay on the walls of houses. The De Soto accounts of 1539-1542 refer to houses and temples covered with cane mats. A very interesting description of cane used for roofing in the same fashion as ceramic tile is recorded by D’Iberville in the early 1700s. Household: Cane mats were used in many different ways by Southeast Indians. Several early authors refer to the placing of mats on the ground for covering the floors of some houses. Beds were constructed of parallel canes tied together placed on supports and covered with cane mats. Cane mats were used to wrap the dead and one reference mentioned a cane tent or roof placed over the body. Cane was used in cooking for stirring, cutting, and dipping. Ritual drinks used cane containers. I have observed the Black Drink being prepared by a medicine man blowing into the drink which caused it to froth up before serving. A hollow length of cane would be especially valuable with an open fire. It would be used to blow upon the embers to get the fire started up and create a hot fire for cooking. In Asia, a blow pipe was an essential tool of the country women cooking over charcoal fires. Joints of cane provide some of the best small containers for spices. In many areas of the world bamboo is the principle container for carrying water. Fire: Cane has been used as torches since prehistoric times. 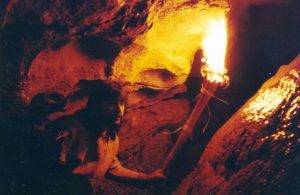 In the Salt River Cave of Kentucky the remains of cane torches were found that were carbon dated 2000 B.P. One of my students conducted an experiment and found that he could make cane torches that would last for at least 45 minutes and provide light that he could read a newspaper at 10 feet. D’Iberville describes a torch made of a bundle of cane 15 feet tall with a diameter of two feet which provided light for festivity. The Creeks commonly used a star of logs but for certain ceremonies would construct a spiral of cane that would burn for some time and place a time limit on the conference. Miscellaneous: Cane was used in many other ways by Southeast Indians. 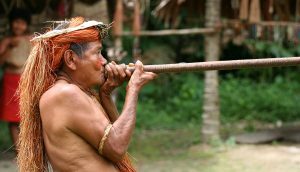 Blow guns were made of cane in historic times, but may be of African or South American origin. Canes were used as shuttles for net making and for loom weaving, which also may be a post-contact use. Stems for clay pipes were mentioned as the first references to the use of tobacco. Punctation on pottery by cane is a common design element. Cane was used to bore holes for stone pipes with water and sand. Cane was, and is, used for making musical instruments. Rivercane was also used for making flutes. 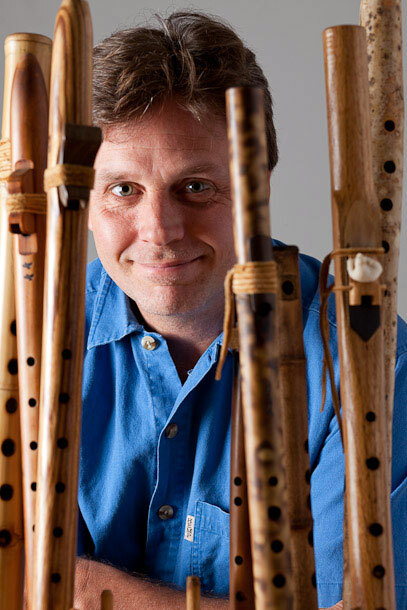 Hawk Hurst keeps this skill alive and you can purchase flutes from him. He also makes drums and is an amazing storyteller. Click on image for more information. 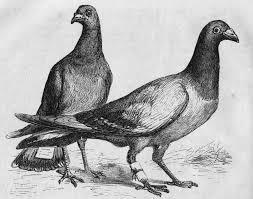 Before European colonists arrived in North America, Arundinaria grew in vast canebrakes. Early American botanist William Bartram described the thickets as appearing to have “no bounds but the skies.” Indeed,they stretched over what are now 19 states in the South, Midwest and East,and as far north as Ohio. Explorers on horseback or on foot cursed the stuff, which they found nearly impossible to get through. Pioneers, however, taking note of the luxuriant growth, reasoned that a good stand of cane meant good soil for crops. They cleared the land for plantations and homesteads by cutting and burning it. When they were through, the big cane was nearly gone for good. A third bird that depended on the big cane for nesting is Bachman’s warbler, hovering so close to the edge of extinction that the last undisputed sighting of it was in Virginia in the 1960s. 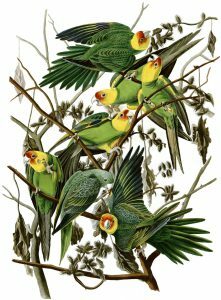 Louisiana State University ornithologist James Van Remsen, Jr. theorizes that the bird’s recurved bill may have become specialized for gleaning bamboo. 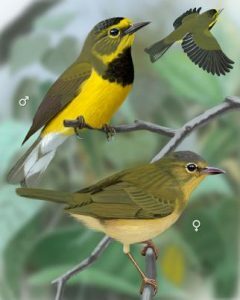 At any rate, the warbler lived in close association with North American Arundinaria. 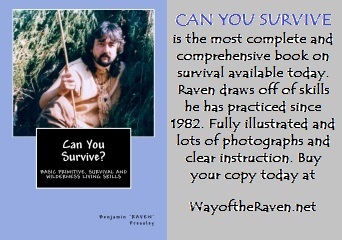 BY BUYING A COPY OF MY BOOK!